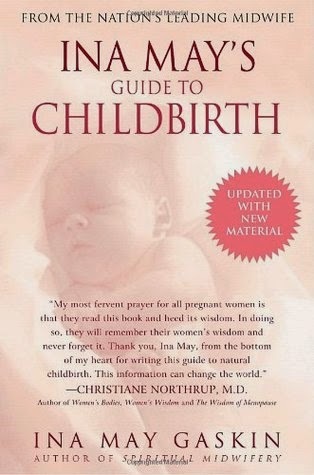 I can only imagine what went through your head as you read the title of this post: Ina May's Guide to Childbirth?! YES! I've been waiting for this book review for MONTHS! No? More likely, you're not even reading this right now because once you saw what this post would be about, you thought, Maybe I'll go check Pinterest instead. In which case I'm talking to myself. Well then, why am I wasting time with small talk? Soon after I had Bradley, one of my natural childbirth friends (yes, I do label my friends as home birth, natural, epidural, or C-section with further classifications as necessary) recommended Ina May's Guide to Childbirth. With a newborn in my arms, it didn't really seem like it would be all that helpful of a read, but I tucked it away (i.e., added it to my to-read list on Goodreads) for a future date. For my previous three pregnancies, my preparations included a natural childbirth class, a hypnobirthing class, reading Hypnobirthing: The Mongan Method, and practicing visualizations and relaxation techniques. All of these things were helpful, but I was ready for some new information (or at least the same old information presented in a new way). Plus, I honestly didn't think the same relaxation scripts from last time would put me in a state of calm since I now associate them with painful contractions (sad, but true). My initial reaction to Ina May was discomfort. In the first ten pages, one of the birth stories described a woman sharing her birthing energy with another woman who was supporting her in labor. This other woman (who had recently had a baby of her own) began having contractions at the same time. Say what? It all just seemed a little too unorthodox for me. When it had to go back to the library (and I still had read only 15 pages), I considered not requesting it again. While I am a huge fan of unmedicated labor and delivery, I've always had the desire to give birth in the hospital, so it seemed like this book where laboring women climbed trees (not making that up) might not be very applicable to me. But I had hardly given it a chance. And I knew I needed to do something to remind myself I was going to have a baby in a few weeks. So I checked it out again. The book is divided into two parts: birth stories followed by instructions and advice. I found it most helpful to alternate between reading a couple of birth stories with a chapter from the second section. realistic descriptions; I don't think Ina May ever promises "pain-free" labors. Rather, birth is energizing and fatiguing, exhilarating and painful. This was so comforting and liberating for me. With my other three pregnancies, I spent a lot of time practicing with relaxation scripts because the hypnobirthing method claimed that labor could be free of pain if you were able to stay relaxed and take your mind to another place. Most of Ina May's stories and suggestions felt very tangible and physical: go on a walk, change positions, laugh, breathe, have someone squeeze your hips or rub your back, etc. She also suggests positive affirmations because she believes in the mind/body connection, but she never says anything about magically turning off the pain. Rather, she makes suggestions for how to channel that intensity productively. birth stories; I felt like I learned so much from the various birth stories that were shared because they demonstrated how every woman's labor is individual and different. They also showed various techniques in action. Plus, there's just something so motivating and exciting about reading another woman's positive birth experience. suggestions for different birthing positions; when I delivered Bradley, I was very frustrated with the midwife (she was not my midwife but the one on call at the time) because she insisted that I be flat on my back to push him out. This felt so counter intuitive to me, and I couldn't figure out why a midwife could only catch a baby one way. Reading about the wide variety of positions empowered me to be communicative about what I want, especially my need to remain flexible. I especially found the birth stories involving shoulder dystocia fascinating. The thought of big babies getting stuck terrifies me (especially since Maxwell was 8 lbs. 11 oz., and he had his hand up by his face), and I really appreciated her suggestion of the hands and knees position in order to open up the space a little more. advocating eating and drinking during labor; since I'm giving birth in a hospital, this is probably out of my control a little bit (they have rules there, you know). But still, it was so nice to read the evidence that eating during labor is not only safe but also very beneficial. I am always starving during labor, and the nurses and midwives always act like I'm crazy for feeling like I need to eat. I'm tempted to sneak in some food this time (and yes, just in case you're curious, Ina May does go into the reasons why doctors don't want you to eat during labor, but she also gives a lot of convincing research for why this isn't something that should be a serious concern). the chapters on medical interventions, c-sections, and mortality rates; I didn't have a problem with her making the point that natural birth is, in most cases, safer, healthier, and more effective than medical births. I just found the information boring and tedious to get through and felt like those pages could have been used in a more useful way for the types of women who are probably reading this book. No recent birth stories; the book was supposedly updated (she does give some statistics from as late as 2006 and 2010), but the stories are really old; most are from the 70's and 80's, with a few from the 90's, and just one from the year 2000. I'm not saying I didn't get a lot out of the stories from 30 and 40 years ago, only that it would have been nice to have some more recent stories thrown in. Since she's still practicing midwifery and since she obviously took the time to add some new material, I would have really liked a few recent stories added to the mix. I am 36 weeks today (yay! ), and reading this book has definitely put me into birth mode. I'm kind of obsessed with it actually. Now if I could only find a way to bring that reality home to Mike. I think he's going to be in for a shock when he's back in the labor and delivery room in just a few weeks. He could probably do with a little refresher course of his own. Update: read about how it all went down here. You might like The Bradley Method of Natural Childbirth--for your next baby?! Isaac had shoulder dystocia. He and Corbin were 9.5 lbs. Birthing them was difficult, but I'm glad I did it and I'm thankful there were no complications. Five children ago I fervently believed in home birth. I still feel it's valid and potentially beautiful, but it's not the best decision for everyone. I just always labored forever at home--thus avoiding IVs, monitors, and intervention. I'm excited for your family and hope you have a great labor & delivery!